Video clip of the Pacific Sun, including an interview with Captain Peter Philpott and promotional footage of the ship's pool and restaurant. Filmed while in Port of Auckland last year by NZ Herald. The MS Pacific Sun is a Holiday class cruise ship operated by P&O Cruises Australia. She was built in 1986 by Kockums Varv, Malmö, Sweden for Carnival Cruise Lines as MS Jubilee. At 47,000-tons, the Pacific Sun is a medium sized ship, accommodating up to 1,900 passengers from Australia and/or New Zealand. 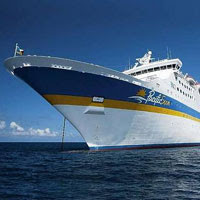 Pacific Sun currently operates cruise itineraries to the South Pacific and Queensland. She is currently based out of Brisbane. Video: Captain Peter Philpott speaks on the bridge of the Pacific Sun cruise ship.